Being the world’s second-largest country, Canada is vast and has a lot to offer. With world-famous national parks, glistening glaciers and gorgeous waterfalls, it is certainly a place that is well-known for its breath-taking scenery. 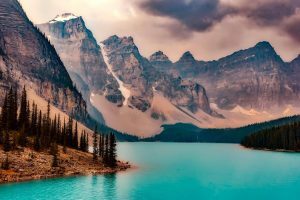 Apart from the stunning natural beauty of the wilderness, Canada is also home to a number of diverse, trendy cities, each with its own thriving restaurant, bar and music scenes. Above all, Canadians are universally known for being friendly and welcoming, making it the perfect place for British expats to move to. So if you are thinking of relocating to Canada from the UK, there are a few things you should know before making the big move. Although UK citizens can visit Canada visa-free if only staying temporarily (as long as they have an Electronic Travel Authorisation (eTA), which can be purchased easily online beforehand), for those intending to live and work in the country, a visa is needed. Visa applications are approved based on whether the Canadian government believes the applicant is going to be an asset to the economy. While this might be difficult to predict, there are certain information guides which can help you get a good idea of whether you will be accepted, as well as the government’s eligibility tool. There are a number of different visa types available for UK citizens, and the category you should apply under will be based on your individual circumstances. The most common type applied for is the skilled workers and professionals visa. Nonetheless, it is worth pointing out that the visa application process tends to be lengthy and in many cases, you will need to show you have a job waiting for you or prove you will be able to financially support yourself while looking for one. Other visa types include family visas, entrepreneur and investor visas, and visas for people who have certain skills which are needed in a particular Canadian province. The Canadian healthcare system is of high-quality, making it one of the most appealing aspects of living in the country. Canada has a public healthcare system that is similar, in nature, to the NHS here in the UK. However, there are a few notable differences. Each province in Canada has its own health insurance card and ministry of health, which means free healthcare coverage levels can differ between provinces. That being said, wherever you may be within Canada, the healthcare system should include GP visits, medical emergencies, hospital stays, surgery and essential vaccinations. Like the NHS, dental costs and other health services, like an optician visit, may only be somewhat covered. It is recommended that British expats immediately cover themselves with health insurance for at least the first three months, as in some provinces you may not be entitled to free healthcare right away. There is, quite often, a waiting period before you can meet the residency requirements necessary to receive free healthcare. Canada is officially a bilingual country (English and French), with almost a quarter of the population speaking French, largely centered in Quebec. As such, if you plan on moving to any cities within the Quebec region, it is worth polishing up on French as a matter of courtesy. Like the USA, Canada has a very established tipping culture, which means it is expected for customers to tip those in customer service facing roles a standard 15-20% of the bill. This includes wait staff, bar tenders, taxi drivers, tour guides and hotel staff. Although we tend to tip in the UK if we feel the service has been good, in North America, it is customary behaviour, and those who do not tip may be perceived as rude. This is due to the fact that customer service industry workers tend to be paid poor wages in comparison to the UK, meaning they rely heavily on tips to make ends meet. Because of this, you will certainly notice a higher level of service in most places you go. Perhaps the biggest adjustment for Brits moving to Canada is the climate change, as Canadian winters can be harsh and cold. Locals are used to dealing with snow and ice on a daily basis across the country during winter (and sometimes even in summer!). Bear in mind, the closer to the USA border you move, the less tough the winters tend to be. Overall, Canada has a high quality of living, making it an appealing place for British expats to move. Vancouver, in particular, is consistently voted one of the best cities in the world to live, and the country as a whole offers safe and pleasant living standards. If our expat guide to Canada has sold it to you, then choosing an international removals company that handles Canada moves can certainly help minimise the stress that comes with emigrating abroad. It is important to pick a company that is capable of handling your whole move, has the right qualifications and accreditations to do so, and has successfully carried out many other UK to Canada moves in the past.